Catalina Custom Upholstery can provide consumers with services for marine tops and covers from repairs to new construction. A lot of times, just a repair (patch installed, zipper replaced, seam resewn) is all that is needed on an existing item that will let a person continue using that same item for more years to come. If an item is beyond repair, then it can probably be used as a pattern to build a new one. If a brand new item is wanted or an existing item is to be modified, then Catalina Custom can provide the construction of custom applications. Below is a brief overview of the different types of materials used in most marine applications on boats dealing with tops, covers and enclosures. When building different types of tops, dodgers and covers, Catalina Custom offers materials to meet a variety of customer requests. Weblon is a good material that is used when cost is a factor. Stamoid is a top quality material used to meet requirments for solid materials with good light requirements and top quality protective coverings. When canvas is requested, Catalina Custom offers a wide variety of top quality acrylic canvas from Sunbrella, Outdura and Recacril with a good selection of colors to choose from. When top frames are needed, Catalina Custom offers a variety of choices. When a standard Bimini top is wanted, Catalina Custom offers total package tops that have a universal top frame constructed of aluminum tubing and nylon fittings. This most cost effective basic top is covered in good quaility Weblon material. This option is the least expensive way Catalina Custom can outfit a boat with a Bimini top. If a custom application is required, there are two choices: aluminum tubing with nylon fittings (good to keep cost down) or top of the line 1" stainless steel tubing with stainless steel fittings. These are the best materials available to build different types of frames. Clear flexible windows, made from clear sheet vinyl, are an investment that need careful consideration in materials used in their construction. Windows / enclosures can be a very nice addition to any boat. Catalina Custom offers a good variety of polished sheet vinyl. 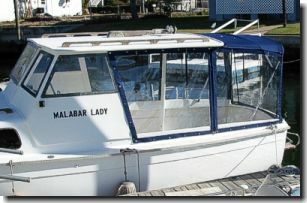 If a job is a smaller type project where more flexabilty is better, then a lighter weight (30 mil) clear vinyl would be ok. Small boat enclosures that have windows built into side or back-drop curtains are one example. If the project is for a large flying bridge enclosure, then a more rigid (40 mil) window would be better. The best made window available is Strataglass brand clear windows. They are top of the line concerning scratch resistant qualities, uv protection, very good clarity and giving good life while resisting wear and yellowing. Also available, tinted clear vinyl windows in a smoke or charcoal tinting. When constructing any outdoor or indoor marine project requiring zippers, Catalina Custom uses only top quality zippers specifically designed for outdoor marine requirements. "Coil" teeth zippers is also available for curved or "smilley" zippers when needed for enclosures. Just about every project requires sewing and thread is a very important part of that project. Catalina Custom only uses polyester UVR (Ultra Violet Ray) processed thread. This is a good thread for outdoor projects. Also available as an upgrade (with an upcharge per job) is PTFE threads. These threads carry manufacturers lifetime limited warranties and the thread can outlast the fabric the thread has sewn.